With great pleasure, I want to introduce you today the project of an Italian startup: 4zerobox. 4zerobox is a module, DIN-rail mountable (9 modules), designed to complement or replace a classic PLC in industrial automation applications. 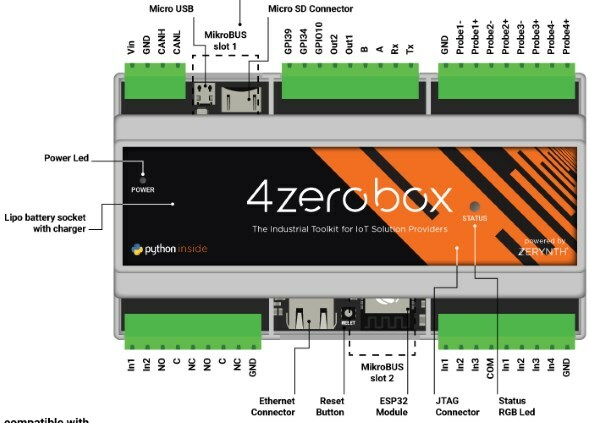 As the name suggests, the features of 4zerobox can help companies interested in implementing Industry 4.0 solutions. 4zerobox is a project by the italian startup TOI (Things On Internet), born within the University of Pisa. Currently a Kickstarter campaign is active to found the production. The “heart” of 4zerobox – and that’s the reason why I’m writing about it in this blog – is the esp32 chip. Thanks to the partnership with Zerynth (I’ll blog about it more widely in a future article) you can program the module using the Python language and leverage already available high-level libraries for the different I/O and communication interfaces. Very interesting is the possibility to connect, using the MikroBUS bus, several external devices. MikroBUS is indeed a standard interface (defined by MikroElektronica) and soon adopted by many manufacturers: there are already more than 300 different boards that offer the MikroBUS interface and can therefore directly connected to 4zerobox. 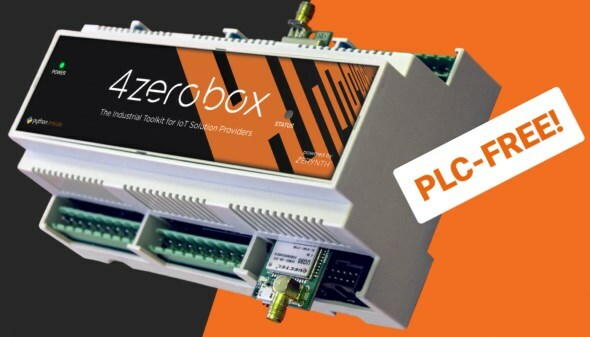 In conclusion 4zerobox can allow companies to respond easily to integration, IoT, cloud… requirements that are relevant to the Industry 4.0 trend.